Fig. 1 Which approach move? SnotNose What factors apply when considering whether to approach the 3-4 black stone at a or b? Presumably the stones in the lower left corner matter. Perhaps those in the upper right do as well. Finally, perhaps there are issues of territory and influence. However, with so many possible continuations (think of all the possible pincers alone!!! ), I don't know how to make this decision. Does anyone? Or is it a matter of style? Contributions welcome. SnotNose One idea that occurs to me is that if white has a thick position in the lower left corner, facing upward toward the upper left, perhaps a play at is good since if black ignores it a press at a developes white's moyo. Or, white can play b and hope for a Taisha fight. More generally, if white wants to develop the left, the low approach move might help. 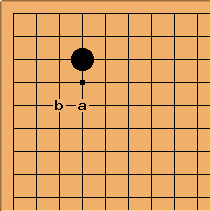 Of course, if black doesn't tenuki, white won't get to play a or b. One thing is certain, black won't pincer here so that cuts down the possible joseki to consider. SnotNose But, if we add some more stones to the board, giving black a moyo in the upper right, perhaps is now bad since that permits (or black can play a himself), squashing white's moyo and expanding black's. Perhaps in this case a is better (let's leave out the idea of approaching from the other side for now). SnotNose I can't resist giving this high approach example. Black can still develop the top with the attachment . Black and white then push along the line between the moyos. Next black plays a. 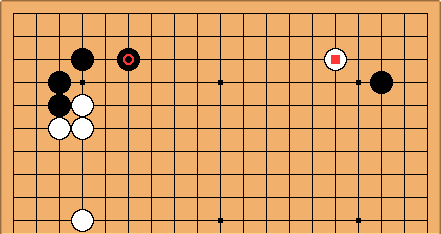 Later black can play b to take more corner profit. So, white has less to hope for in the corner this way. SnotNose So, the problem of which approach to choose, high or low, can get complicated, and I'm giving very simple examples!!! With directon of play less clear and with pincers possible, it gets awfully hard for me to select the right play. Anybody have some general guidelines and/or examples? BobMcGuigan: It is really hard to give general rules about when to play high or low since the whole problem is so context dependent. 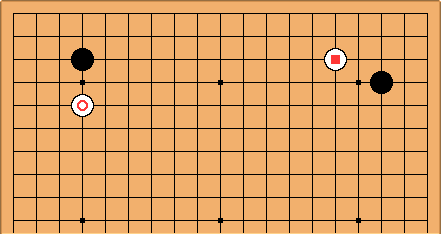 Some issues that have to be considered are: balance with whatever there is in the lower left or upper right, whether white is aiming for territory or a moyo, and even whether white might want to play a two-space approach move. Your examples all had white in control on the left side but white might approach the upper left corner when black controls the left side, e.g. in the Chinese fuseki. Charles See for example forbidden high approach, or the article http://gobase.org/studying/articles/matthews/fuseki/07/. As Bob says, there are a number of possible types of examples and considerations. This is quite a rare combination ( high, low) in pro games. The other three possible types are more common. Assuming a white 4-4 stone lower left, as we look at it, this is reasonable for White on the left side. But you could say that the stone stops White doing anything very effective with , now. Black can probably take sente to play elsewhere. Evand: Consider also the following position, taken from The Direction of Play. 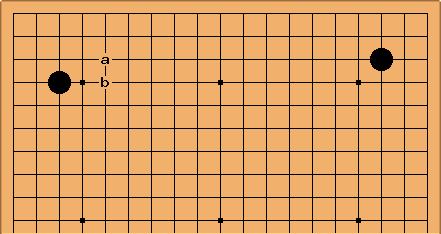 However, Kajiwara explains that has little effect on the 3-3 stone, and so is not a very good move. Therefore, Black approaches low. This would suggest to me that a large piece of the high/low decision is based on the same principles as all of the rest of joseki choice, namely whether at the end the stones are in good places. 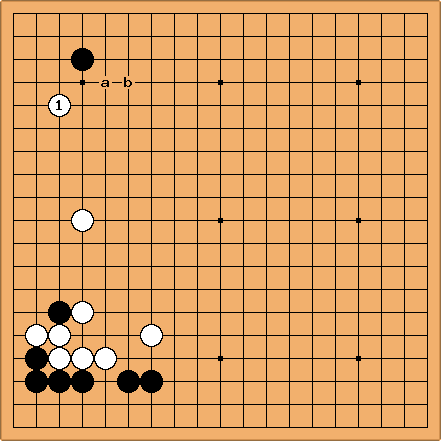 Since is not well placed, Black chooses a different variation. Charles Well, it can't be that simple. 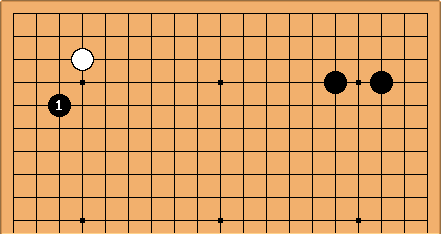 Look at this side pattern alone, and ask a crude statistical question: is White's next play here at a or b? Then quite convincing numbers come up in a database search: a and b are equally likely. There is certainly more to be said about that result. But reverting to the previous diagram, you can say that there contradicts Black's choice of the small high enclosure in the upper right. Given that context, I see the reasoning. There are few enough examples of this side from recent times in pro games - a small sample only from the last 25 years. When Black does approach in the upper left, is preferred. Dave: Once the stones start growing this is a very complex question. On the other hand, in the beginning, the issue seems to be dominated by who holds the opposing corner. If White approaches from a her own position, she prefers the low approach. If her approach wedges between two Black corners, she tends to play high. This tendency is pretty clear in professional games since the 90's. In my data, White prefers to the high approach at a by about 4 to 1 over the period 1990 - 2004. Here the difference is less, about 2 to 1. Here the difference is more, over 5 to 1. This is not surprising, see opposing 3-4 points. When the opposing corner is Black, White approaches high at about 4 times more often than the low play at a. 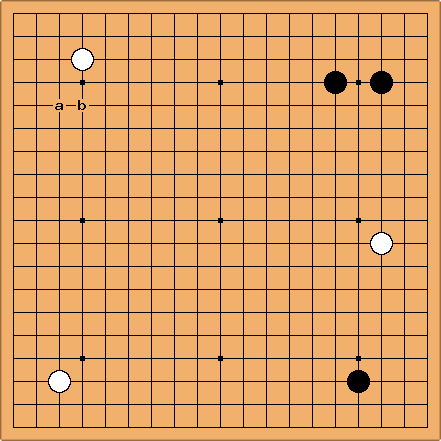 In addition, White is as likely to use the far approach at b as the play at a. Here White is actually much more likely to approach the upper left (normally from a White position in the lower left) than the upper right. However, in cases where White chooses to approach the upper right first, the high play at is more than twice as frequent as the low play at a. Here White is more than 5 times more likely to approach high at . With the shimari in the upper left the case is more extreme. White is 10 times more likely to approach at than at a. The distant approach at b is also twice as likely as a.